Whether you started a garden and are overrun with cucumbers or found a fab deal at the farmer's market and brought home a bushel of cukes, you are not relegated to salads for breakfast, lunch and dinner. In fact, there are tons of things you can do with a cucumber. Purchase a pickle mix at your grocery store (look for the "refrigerator" type). Slice up the cucumbers and add the mix and other ingredients into mason jars. It's really easy! There are also plenty of pickle recipes, including Easy Refrigerator Pickles and German Dill Pickles. Is Indian food a little too hot for you? Make a raita sauce, the perfect thing to cool it down. The combination of yogurt and cucumber in this riata sauce recipe really tempers spicy foods. Recline on the couch with a slice of ice-cold cucumber over each eye. The cooling sensation helps sooth red, tired eyes, while the high water content works to reduce puffiness and can even eliminate dark circles. Another of the cucumber's amazing attributes is that it acts as a diuretic. 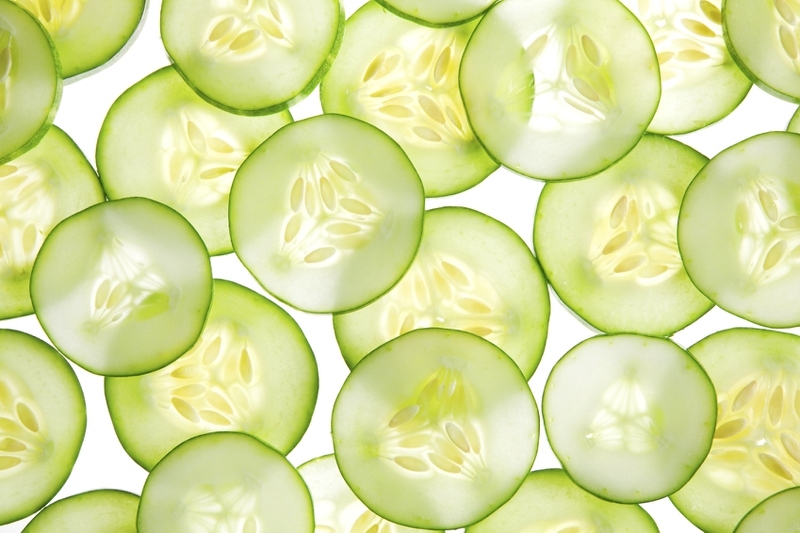 The next time you feel bloated, wash—but don't peel—and slice a cucumber. Add the slices to a pitcher of ice water and drink it down. Cold cucumber soup is heaven on a hot summer evening. Many recipes play off of this basic formula: chop or puree two peeled cucumbers and mix with one cup each plain yogurt and sour cream. Add a cup of chicken broth and salt, pepper, garlic powder and dill to taste. Mix well and chill for at least two hours. Here's a great cucumber soup recipe. This Greek fave is perfect for gyros, pitas, veggies or pretty much anything else you want to dip or top. Mix 1/4 cup peeled, grated cucumber with a cup of plain yogurt. Stir in a heaping teaspoon of minced onion and a dash each of salt and pepper. Store in the fridge for up to two days. There's a great formula for the sauce in this Greek Turkey Burgers with Tzatziki Sauce recipe too. Host a tea party for your BFFs and serve fancy little cucumber sandwiches. Simply cut the crusts off thin white bread. Spread a thin layer of cream cheese on each slice and sandwich peeled, sliced cucumbers between two slices. Slice diagonally to make perfect wedged sammies. Slice three small limes and place them in a pitcher. Juice three more limes over the slices. Toss in a cup of fresh mint leaves. Add two slices of scrubbed cucumbers to the mix along with 1/2 cup of sugar. Top with two cups of gin or vodka and set in the fridge to steep for half an hour. Scoop ice into a cocktail shaker and top with the mixture. Give it a good shake, strain and serve. You have had fried zucchini, maybe even fried green tomatoes, why not fried cucumber slices? Peel and slice a couple of cukes. Dredge them in cornmeal and fry until golden brown. Delicious! Cucumber is a natural astringent, so a cucumber facial is cleansing and soothing. Puree half a cuke in your food processor or blender. Add a few mint leaves, a tablespoon of lemon juice and an egg white. Mix them all together and then smooth onto your clean face. Leave for 15 minutes and rinse with warm water. Follow with a splash of cool water to close your pores.